Today I started out in Wexford town and the first port of call was the new Leisure Centre at Ferrybank to stand in out of the rain! There was quite lengthy shower and I waited it out - there were to be several showers today, but I managed to get through all OK.
As I had travelled much of South Wexford last year I determined to visit only new places. I set out on the Rosslare road having looked at a map that indicated that I could go across the South Slobs to Rosslare - not so. But the Slobs are a pleasure to ride through, though the lane is not suited well to a Harley. Lots of fields of wheat and hay - very little animal life. I took lots of pictures, but none on my iPhone - they are on a camera that I cannot get the photos off until get to a PC. 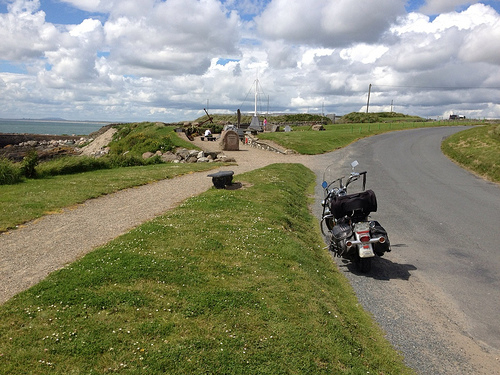 After the Slobs I headed to Kilmore Quay where I stopped for lunch in Kehoe's Bar. My sister Kayo had reommended the Triple Fish combination - so I tried it and was not disappointed. Outside Kilmore Quay I stopped at the Memorial Garden which is dedicated to those who lost their lives at sea. There are a lot of names listed on the monuments - the sea has taken a heavy toll over the years here. Next was to go to Ballyhack to get the short ferry to Passage East in Co Waterford. This ferry cuts out a long round trip though New Ross, so saved a lot of time. In Passage East I checked out the Geneva Barracks ruins just to the south of the village. Apparently this was a site for a short lived colony of disaffected Swiss people, set up in 1782, who wanted to leave Switzerland. The colony failed, and the Swiss returned home no doubt to set up a bank and become incredibly rich.